oikos Tbilisi is organizing the project “Lets Save Another Tree Together”. 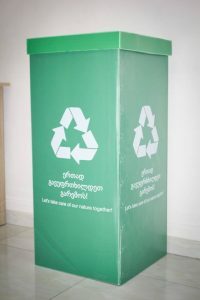 Within the framework of the project, “Green Boxes” will be installed at the X building of Tbilisi State University from October 18. The Green Box aims to promote the collection and recycling culture of waste paper and popularization of paper packets. If you have paper: unsuccessful prints, spoilt sheets, useless Xeroxes, notebooks, books, magazines or newspapers – JOIN US! The project is supported by Tbilisi State University and bookshop “Biblus”. Let’s take care of the environment together.